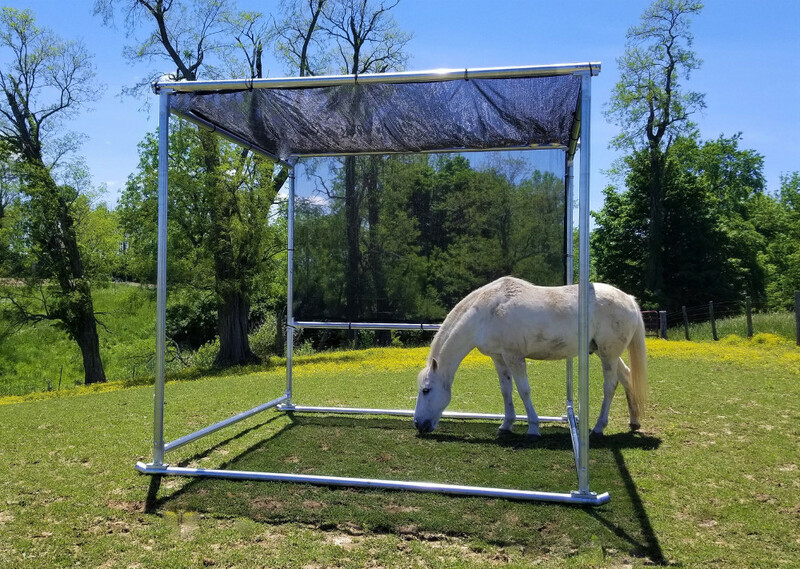 Klene Pipe’s Portable Shade Structures provide ample shade for your horses or cattle. We offer a new complete portable shade kit or a DIY portable shade kit. Our cattle and livestock shelter kits are made with galvanized steel tubes and built to last. Providing ample shade for your horses and cattle is incredibly important. Did you know that extreme temperatures can cause your animals added stress or even cause serious health problems? 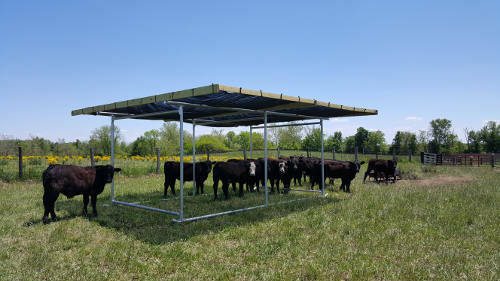 Protect your animals from the hot summer sun with Klene Pipe Structures’ DIY portable shade solution livestock shelter kits. All you need to do is attach your 2” x 6” lumber to the steel tabs on the top, and add the shade cloth of your choice and you have a completely portable 20’ x 20’ shade. 10’ x 20’ Frame – The frame is made from heavy duty 10 gauge 2 ½” galvanized steel tubes cut to size. Available in Multiple Heights – Available in 7 foot, 8 foot, 9 foot or 10’ heights to accommodate animals of all sizes. Built on Skids – Our portable shade is built on two runners, for easily portability. The skid is the the only part that touches the ground making it easier to move around your pasture. Sturdy Design – Made from heavy duty galvanized steel. Frames bolt together. Easily Portable – Strong enough that your portable shade can be moved from pasture to pasture whenever needed. Great for Animals of All Shapes and Sizes – These frames are not just for horses and cattle. Goats, sheep, hogs, alpacas and many other types of animals can benefit from the comfort of shade during the hot summer months. Fast Assembly – Assembly time for 2 people to erect the frame is about 1 hour. Break Down For Winter Storage – Portable shade structures easily come apart for storage during the winter months, all you need for assembly is a 9/16” wrench. Shipping is available to anywhere in the continental U.S.